When winter rolls around, usually sooner than we would like, the cold weather requires your furnace to work much harder than the rest of the year. With the increased burden on your furnace, there are a few maintenance tips to keep it running smoothly in top condition, and it can even save you extra cost in your pocketbook. Furnace filters are recommended to be replaced every month so the air flow is not restricted from dust and buildup, although every household's situation is different. For instance, high-efficiency furnaces don't need their filters changed as often, maybe every three months or when the season changes. It also depends on how many pets occupy the house, or if anyone smokes in the house. These factors all contribute to how dirty the filter gets. People with allergies should consider changing their filters more often to keep the air as allergen-free as possible. Furnace filters range in price but for a general filter the cost is usually somewhere around ten dollars. Pleated filters, HEPA filters, and electric static filters should be considered in the winter to increase energy efficiency and to allow the warm air to flow evenly through your home. Air vents should be cleaned out whenever dust and dirt buildup is noticed, about once every season. The process is fairly simple. Just use a screwdriver to unscrew the vent and use a vacuum hose to clean out the vent as far as it can reach, and wipe off the vent covers with a damp cloth. Air ducts are important to have professionally cleaned every three to five years, again, depending on the household's situation. Set your thermostat so that it automatically lowers the temperature at night and raises it in the morning. Doing this can save you a sufficient amount on your furnace's operating cost. If you live in an older home and don't have a thermostat with this capability, it would be worth looking into replacing the old thermostat with a programmable one. 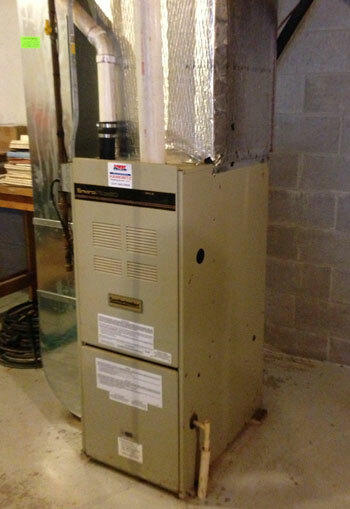 Always keep the area around your furnace clear and free of clutter and debris. The exhaust flue outside should always be clear of obstructions as well. All air vents should be opened and furniture should be arranged so that it does not cover the vents or restrict air flow. Although furnaces are relatively easy to maintain, if there are any problems or if something seems suspicious with your furnace, it is important to call a professional to handle the concerns. And always, if you smell gas coming from your furnace, call a professional immediately! Gas leaks are extremely dangerous and should not be taken lightly.